The technique of the all-on-six implant is a surgical procedure that allows the realization of a single session or within 24 hours (depending on the case report submitted) a fixed prosthesis anchored on 6 dental implants. The patient is subjected to the extraction of the elements present. The professional arming of 6 plants, 3 for each emiarcata left and right. Application of the temporary prosthesis anchored to 6 dental implants. The hearing will be before a type of party and within 3-4 months will be replaced with a permanent prosthesis. 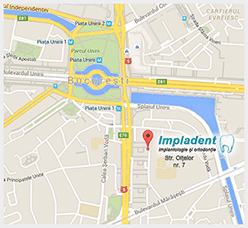 Here at Impladent, you will be welcomed into an ultra modern relaxing environment, specifically designed to promote your sense of calm and well being, and you will be looked after by our caring team of dentists and dental hygienists, who will ensure that you will be put at ease and receive the highest quality dental care tailored.